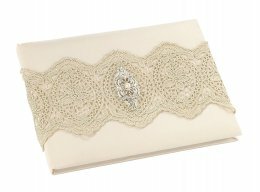 This 8.25" gold lace and rhinestone/pearl accent make this ivory satin guest book the perfect reception accessory. It contains 55 pages and hold 990 signatures. Also ideal for other special events such as, engagements, anniversaries & baby showers. The Ribbon Diva offers a large selection of elegant Wedding Reception Accessories.